Every record is an island. An artist’s statements shouldn’t always be judged on trends, the label they’re on, or what other people are doing. Perhaps they shouldn’t even be judged against that artist’s own work. It’s all too common in the current state of music journalism or criticism to hear, “This isn’t as good as their old stuff,” or as whatever the landmark release is in that genre. Just look at how every shoegaze record has been measured again My Bloody Valentine’s Loveless. Still, when a label releases two records on the same day, it’s hard not to read into it, or at least wonder if there’s some grand vision at work. Especially when that label is Sacred Bones, who are known for collecting skinny post-punk, black tie new wave, tar-dipped goth rock, excoriating noise, and many, many shades of psychedelia under their eye-catching triangle in the circle marker. On November 11th, Sacred Bones released two widely dissimilar records: the motorik futurism of Dream Police’s Hypnotized, and the apocalyptic folk goth opera Final Days, from the mysterious Cult Of Youth. And just as Sacred Bones might be offering these contrasting views of the future, it seems that conflicting views of the past may be the impetus behind Hypnotized and Final Days, and perhaps Sacred Bones entire corpus. Let’s pluck out, for a moment, the psychedelic thread, one of many present. One of the definitions of the adjective “psychedelic”, according to Merriam-Webster is, “imitating, suggestive of, or reproducing effects (as distorted or bizarre images or sounds) resembling those produced by psychedelic drugs.” This could be reduced to include any art that conjures images in your mind, which would be the psychedelic dimension of music. Most journalists use the term psychedelic music as shorthand for music inspired by the latter half of the 1960s, usually in regards to acid rock, jam bands, and orchestral pop music, a la Sgt. Pepper’s. However, I think few would argue against krautrock / kosmische / motorik music as psychedelic, to the extreme; it’s just a different flavor of psychedelia. The psychedelic current has wound its way through every decade since the term was coined, and probably winds backwards, as well. This definition of psychedelia ignores the existence of ’70s and ’80s musical movements, like The Paisley Underground, The New Romantics, post-punk, and certain flavors of Goth, which could actually be reinterpreted to mean “dark psychedelia”. Consider Siouxsie And The Banshee’s whitewashed version of “Dear Prudence”, for illustration. Many records from The Cure were psychedelic in the extreme, full of creeping, cavernous echoes and blasted landscapes. Consider, finally, the jewel-encrusted ornateness of the 4AD supergroup This Mortal Coil. This over-simplification overlooks the fact that a whole lot of people enjoy Grateful Dead, the Cocteau Twins, and Amon Düül, with little to no cognitive dissonance. And yet the way it’s written about, talked about, and released does not reflect this wide cross-section of taste, which becomes like an invisible layer in musical archaeology. A taste with no name. Sacred Bones seems particularly attracted to late ’70s and early ’80s dark psychedelia, which is a commonality between these two records. 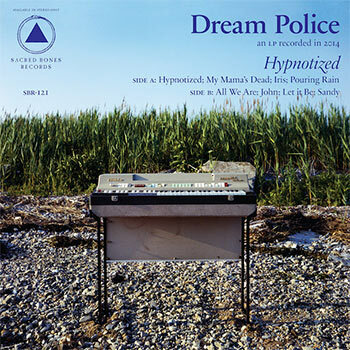 Dream Police go one way with it, into a Technicolor ’70s, while Cult Of Youth represent for what would be considered neo-folk or post-industrial music, specifically Death In June and Current 93, along with modern purveyors like Seattle’s King Dude. On both records, you can hear echoes of The Cure’s trebly throbbing basslines, like something off of Faith: “Empty Faction” off of Final Days, which also bears a strong resemblance to Joy Division, another darkly psychedelic band, while it’s “Hypnotized” for Dream Police, which also expands the psychedelic tributary to include classic first wave shoegaze. Hypnotized, alone, sounds like an exploration of the psyhedelic trajectory, in all its manifestations. Psychedelia is a dirt road for Mark Perro and Nick Chiericozzi to wend, stopping off at country towns on “Sandy”, with its glorious close harmonies that bring to mind those classic Gram Parsons and Emmylou Harris sides, to visit the saloon for a pint with “John”, where Grateful Dead are grinding away with Ray Manzarek, as the house band. For most of Hypnotized, the dirt road expands to become a glistening chrome superhighway, as the motorik groove of Can and Neu! is the most common mood on display. 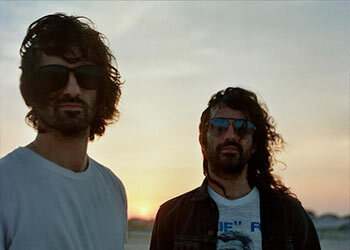 It seems that the main reason for Dream Police to exist is for rhythmic excursions, as it is a side project to the prolific band The Men; it’s a chance for Perro and Chiericozzi to grind away with drum machines and two chords, until their eyes roll up in their head. Infrequently does one hear echoes of Suicide, The Velvet Underground, Klaus Schulze, and The Flying Burrito Brothers on the same record, but one does on Hypnotized. The rough cuts between genres can be a bit jarring, at times, making for a somewhat wonky flow that is not entirely cohesive, but that’s because it’s more travelogue than a self-contained world. It’s a road; it’s a river. Let it take you downstream. Hypnotized is by far the more fun of the two records, which makes it kind of surprising that critics seemed to like Final Days a little bit more. That observation, alone, speaks to the times that we live in. Whether it’s because we’re living in a perpetual death wish, or simply because we’re burned out on krautrock synth records, it’s impossible to say, completely. 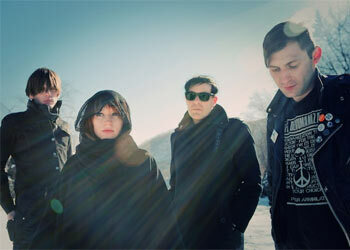 Final Days is Cult Of Youth’s finest statement so far. Sean Ragon grows and grows with each release. They have now expanded to include lead guitar, cello, violin, drums and bass, and the group’s recording fidelity has increased with each release as well, without becoming too polished or pop. Sean Rogan brings some much-needed to the field of “folk punk”, which was revolutionary and exciting when millions of kids discovered house shows and home recording, but it has since become a bit of a joke and a parody. Sean Rogan is punk as heck, with a snarling, growling bit to his shout-sung lyrics. There are moments that bring to mind the classic anarcho-styles of Crass and Flux of Pink Indians, mixing some fresh blood to the crust punk mire, as well. I’d like to see people find out about some of this older music Cult Of Youth have clearly drawn influence from, particularly Death In June and Current 93, both of who have released some outstanding music, but have been damned by supposed fascist leanings (a criticism that was also hurled at Joy Division). Sean Rogan’s biting acoustic guitar may help to acclimate listener’s to an ’80s lo-fi take on psychedelia, the sound of instruments being laid straight to cassette, and conjures a different color palette than the ’60s variant. 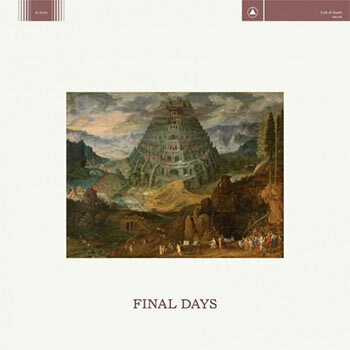 Final Days is a revel at the end of the world. While the apocalypse may be dreaded, and rightly so, maybe it’s not what we think? Maybe it’s not a death, but the rebirth? On “Of Amber”, one of the album’s head moments, Sean Rogan sings, “So come to him with conscience sound/ To embrace the fruiting of the ground.” This sounds like a return to the old ways, a re-embracing of Earth-based religions, of the cycles of Nature. It might beat the last 2,000 years of war, famine, and pestilence. No matter what your view of the future, or what flavor of psychedelia you prefer, you will find something to admire in these twin transmissions – and as long as Sacred Bones keeps releasing records of this quality, I’ll buy ’em, no matter what record bin they’re in.